During chilly winter days when you’re out and about in the city, a cup of hot chocolate is the perfect sweet treat to warm up with. Stop by one of these downtown spots for some of the best hot chocolates in New York City. The City Bakery could possibly be the most popular hot chocolate spot in the city, thanks in part to their annual Hot Chocolate Festival. The cocoa is so rich, thick and chocolaty; it is a good thing that it comes in a mini 4 ounce shot for $2 or a small for $5. Add a fluffy homemade marshmallow for 25¢. Step into Max Brenner for a whimsical chocolate fantasy! Whirling machines of melted chocolate spin alongside the dining tables and gift shop, while tubes carrying chocolate crisscross the ceiling. There are a few varieties to choose from for $5.25 including Mexican and Mocha, with my all time favorite indulgence being the Choco-Pops (dark, milk or white hot chocolate with crunchy chocolate wafer balls). Each hot chocolate is served in an adorable “Hug Mug” for a cozy feel. Belgian chocolate is a popular dessert to eat and sure makes a mean hot drink. Sit in the front bakery or a back communal table at Le Pain Quotidien and enjoy the light, frothy, creamy blend made with your choice of organic milks for $3.95. With ten downtown locations, you can easily find this shop around your nearest corner. Vosges Haut Choclat, a Chicago import, dishes up “couture cocoa”. Enjoy the sophisticated, rich, and creamy Parisienne, voted #1 hot chocolate by Rachel Ray. For a more exotic taste order the Aztec Elixir, a blend of ancho and chipotle chilies combined with cinnamon, vanilla bean and dark chocolate. Both flavorful hot chocolates are served in one size for $4.50. For a solid basic hot chocolate, you can always rely on Balthazar Bakery. Order the standard size for $5. Enjoy with an item from the bakery or on the go when shopping in Soho. Warm up in the European styled Cacao Bar and Tea Salon of MarieBelle. South American cacao beans are brewed with water or milk to a cake batter-like texture. The Milk Chocolate and Bananas will appeal to kids of any age. Choose from a variety of chocolate styles, from White Chocolate and Cinnamon to Maya Dark Unsweetened 70%. Each hot chocolate is luxurious and decadent, starting at $6 for a small. When heading to the 2nd Avenue F train visit Little Veselka, a kiosk outpost of the beloved East Village coffee shop Veselka. This is a perfect in the park location for kids who want to hit the playground and drink their cocoa, too. One size is available for $2.50. A place called Sugar has got to be good! Stop by Sugar Cafe to get your cocoa from the carry out bakery style front or sit in the back of this small cafe. This basic hot chocolate arrives with a squirt of whipped cream for $2.50. Jacques Torres is a household name for New York chocoholics. “Mr. Chocolate” serves his famous drinking chocolates at his factory. 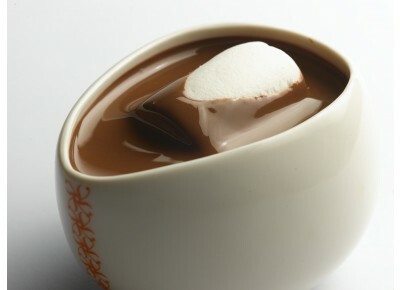 So intensely rich and thick, almost the pudding of all hot chocolates, you might not be able to finish your whole cup. Order the famous classic dark hot chocolate for $3. Specialty flavors of Caramel, White Mint, Orange, and Wicked are also available for $3 - $3.50 per cup. Grab a seat at the bar or a spot at a marble counter at Otto just for a cup of Gianduja Calda, a medium-thick, rich blend of milk and hazelnut chocolates, melted with hazelnut-steeped milk for $4.50. that hot chocolate looks delightful! my favorite place on cape cod is The Chocolate Sparrow and I have yet to find anywhere in the city of Boston that compares!! City Bakery is AH-mazing. When is their festival? I met Jacques Torres when I was a teen. He's so sweet and his chocolate is so good! I don't know of a place in Boston either - will ask my sister! City Bakery's Hot Chocolate Festival is in February (I think).